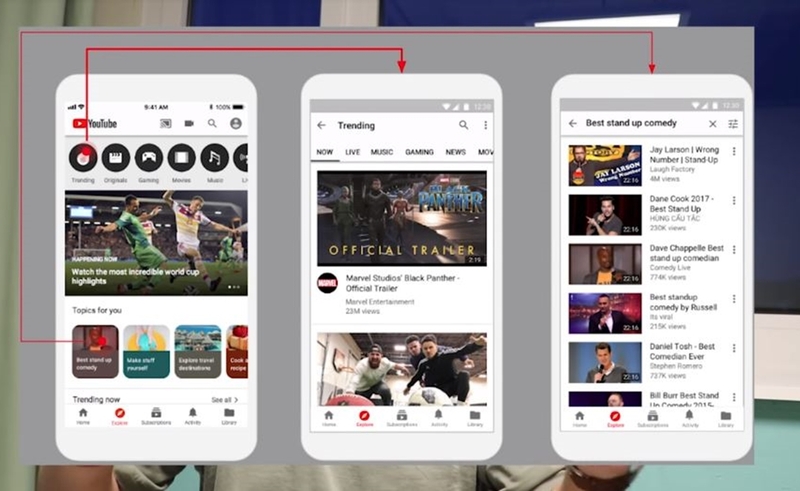 YouTube is experimenting with an ‘Explore’ tab that will appear at the bottom of the app’s homescreen for select iOS users. The experiment was announced today by Tom Leung, YouTube’s director of product management and host of its Creator Insider channel, who noted that it will impact only 1% of iPhone users. Explore will offer up recommended content based on what viewers are already watching, Leung explained, but with a broader scope than the ‘Home’ tab currently does. “Explore is designed to help you be exposed to different kinds of topics, videos, or channels that you might not otherwise encounter,” Leung explains, “but they’re still personalized — so they’re still based on your viewing activity.” If a viewer happens to be watching a lot of videos about telescopes, for instance, then Explore might suggest videos about high-end cameras, he said. Both Instagram and Twitter offer Explore tabs within their own apps — and Instagram recently reorganized its Explore into 13 different AI-powered content categories, including Sports, Food, Style, Nature, and Animals. Creators could stand to benefit from the Explore experiment if it ultimately rolls out wide, Leung says. The ‘Explore’ tab will feature a ‘Creator On The Rise’ shelf, which promotes emerging creators in a variety of verticals, as well as another shelf that will link to the ‘Trending’ tab. And given that Explore will aim to add more variety to the YouTube viewing experience, Leung notes creators would be more likely to have their work exposed to new audiences.